RADP-North is a five-year economic development project funded by the United States Agency for International Development (USAID). RADP-North will focus on the value chains of three key groups of crops: Wheat, livestock (sheep and goats, ), and the high value chains, to enable the business environment around the value chains, and to promote the integration of women into economic activities within the value chains. While the larger RADP-N project will work in six northern provinces, JDA will only work in the four provinces of targeted areas of Baghlan, Balkh, Jowzjan, and Samangan. Under RADP-North we will leverage our expertise and experience in hygiene and nutrition training and community development into the related field of nutrition training. Over four years, we will train at least 10,400 women as direct beneficiaries. Farmer-led Conservation Agriculture teaches farmers three key principles to a more sustainable, profitable, and resilient farm production system in which water use is reduced by 50%: reduced tillage, increased soil cover, and improved crop rotations. The result of this allows farmers to grow crops in low rainfall years. Farm power needs and weed burdens are also reduced. Soil health improvement with better water holding capacity and fertility balance. Farmers understanding how to use mechanized seeders. JDA team conducted training on the three principles of Conservation Agriculture to 1,648 lead farmers Baghlan, Balkh, Jawzjan and Samangan provinces. Farmers were trained on how to reduce tillage, permanent cover crop, crop rotation, benefits of land laser land leveling technology, sowing by two-wheeled tractor, seed and fertilizer rate, harvesting by two wheel tractor reaper, and on different methods of weeds control. The success of the activity resulted in 102 of the 880 trainee farmers becoming ‘adopting farmers’ in 2018, more than tripling the number of CA farmers (from 44 to 146). Out of 880 farmers who received training, 32% applied mulch, 68% rotated the crop, 50% used seeders, 71% controlled weeds, and 58% planted improved seed. We are also experiencing adoption in a large scale in some areas, e.g., in Khoja Sakandar village of Sholgara district, where all farmers are using seeders, and also in Khala Bachagan and Qarchi Gak villages of Dawlatabad district where most farmers use seeders. Laser land leveling technology can save a farmer a great deal of water, and the time and energy of irrigating uneven fields which takes many man hours. It also improves wheat yields by increasing the land's optimum growing conditions, reduces costs by making operations easier than in unleveled conditions, increases growing area, results in less land lost to irrigation infrastructure, and is a precursor to mechanized operations such as seeding and reaping, which can save seed, reduce fertilizer requirements, and reduce costs. The RADP-North Laser Land Leveling activity started in FY2016 with a target of selling forty LLL units to contractors at a 50% cost share. The plan was that each buyer/operator conducting ten field days (400 in total) to demonstrate the new technology to groups of 30 farmers (12,000 in total). 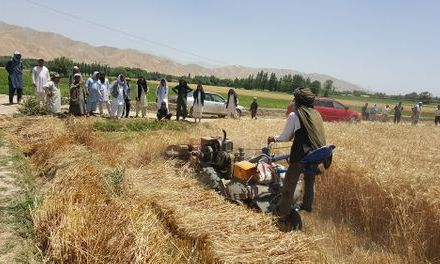 The wheat team handed over 35 land laser leveling units to 35 farmers from Baghlan, Jawzjan and Balkh provinces, and conducted 309 leveling demonstration field days to which 8,823 farmers attended. The field days were held to introduce the technology to farmers in areas where operators see a potential market for service providers. In total, 13,379 jeribs were leveled. The land laser leveling operators operators were contracted by 1,208 farmers and leveled 7,311.7 jeribs of land, generating a revenue of AFN 17,083,845 ($227,784.6). The wheat team evaluated the laser land level operators and found that they are able to perform maintenance, understand safety, and develop their businesses. The operators are also able to perform good quality services and build good relationships with farmers..
Weed Control was a core activity of RADP-North's work in the wheat field because of its immediate impact on wheat yields. Through this activity, farmers are trained in integrated weed management, focusing on weed control mechanical methods, effective and safe weed control by herbicides, the use of personal protective equipment, storage and handling. Train farmers on safety handling and use of herbicides to increase wheat gross margins. Share awareness about human en environmental risks herbicides. Increase the access and affordability of quality back pack sprayers, booms, nozzles, PPE and herbicides for farmers. Over five years, 78, 151 farmers in Balkh, Baghlan, Samangan, and Jawzjan were trained in integrated weed control management. Farmer's yields increased to 57%, or 16,090 tons of wheat. Farmers understand that weed control is increasing their yields and gross margin. This activity also increased the use of herbicides available in the market. Kitchen gardens training educates women on the implementation of healthy kitchen gardens. Most families are currently not eating a diverse diet due to lack of information about how to grow foods and which foods they can easily grow on their own. This activity reinforces hygiene and nutrition training. Grow healthy fresh vegetables seasonally at home. Save money by growing vegetables and herbs. Recycle and reuse waste resources. Make better use of uncultivated lands around their houses to be productive for the family. Provide an opportunity to sell surplus vegetables and herbs in the community for small amounts of additional income. 7,724 women were trained in kitchen gardening . We have seen that 90% of the trained women have purchased their own seed and established their gardens. Gardens allow women to have direct access to fresh vegetables and aids in their mental health.